I Can’t Find My Shadow! Where’s all the shadow inventory everyone keeps talking about? Many economists speculate that we will continue to see depreciation in the housing market due to the fact that there are still millions of homes that have been foreclosed upon that the banks still need to liquidate. Then why aren’t we seeing these homes come on the market? Because some of the biggest banks with the most foreclosed inventory are considering selling these properties in large blocks to major financial investors. Yup, that means these homes may NEVER come on the open market! Good for housing values, bad for first time home buyers. So what if these houses EVENTUALLY come on the market? Seattle home values will continue to free fall, right? Not necessarily. The MILLIONS of homes that still need to be sold are on a NATIONAL level. To figure out how this will affect the greater Seattle area, we need to look at LOCAL statistics. So how many foreclosed Seattle homes are there? Many media sources have been reporting that we still have around 4 years of foreclosed inventory to be sold! But these numbers are a lot closer to 4 months on a local level. This is a DRASTIC difference! Six months of inventory is considered to be healthy housing market, where neither buyers nor sellers have leverage over one another. 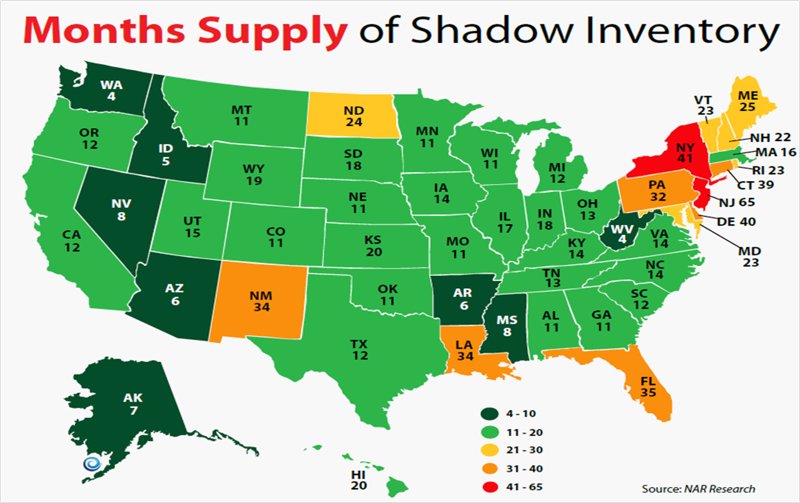 So even if all this shadow inventory does come on the Seattle Market, it still probably WON’T swing things back to a buyer’s market. And in any case, that’s still a big if. In many Seattle neighborhoods we’ve seen a 50% decline in available inventory, and this may not get any better. So are home prices going back up in the greater Seattle area? Yup, and if inventory levels as well as other factors continue to swing in the sellers favor, this appreciation may continue. But it’s not to late! At the moment, many areas are still seeing values that we haven’t seen since 2001, and don’t forget rates are still at all time lows. If you’re thinking about buying your first home in the greater Seattle area, don’t make a decision without getting educated! Go to our Calendar/Reservations page and sign up for one of our FREE First Time Home Buyer Workshops. Seattle House Key Plus offers up to $45,000 in Down Payment Assistance! The funds can be used for either your down payment or closing costs or BOTH. They can even be used to pay down your interest rate or your monthly mortgage insurance premium, which could lower your monthly payment substantially. Seattle House Key Plus is for First Time Home Buyers. But even if you’ve owned a home in the past, you may still be eligible if you haven’t owned a property in the last 3 years. The property must be located inside Seattle city limits. But it can pertain to any property type: single family, townhouse, or even a condo. Seattle House Key acts as a SECOND loan. However, it’s interest rate is only 3% and it’s a DEFERRED payment! What exactly does that mean? It means you don’t have to pay the money back until you either sell the property or refinance. That’s about as close to free money as you can get! If you would like to find out more about House Key Plus or other state funded down payment assistance programs, go to our Calendar/Reservations page and register for one of our FREE First Time Home Buyer workshops. Don’t miss out on the chance to get help buying your first home in Seattle. HomeChoice is down payment assistance for first time home buyers. If you have a disability or have a family member with a disability living with you (as defined by the “Americans with Disabilities Act” ) and are looking to buy your first home in King County then Home Choice may be right for you. HomeChoice offers up to $15,000 in down payment assistance. These funds can be used for your down payment OR for your closing costs OR both! You may be able to buy a house with little to NO money out of pocket! HomeChoice has extremely low interest rates. HomeChoice down payment assistance is a second loan which needs to be repaid eventually. BUT the interest charged is only 1%, it accrues as simple interest instead of compound, and the full amount doesn’t need to be repaid until you sell the home or refinance. This may be as close to free money as you can get when it comes to down payment assistance in the greater Seattle area. HomeChoice assistance depends on an individuals specific situation. So if you think you might be eligible and would like to find out more about HomeChoice or other down payment assistance programs we offer, go to our Calendar/Reservations page and register for one of our FREE First Time Home Buyer workshops. (To be eligible for any of our down payment assistance programs you must attend one of our workshops where you will recieve a certificate of attendance). Are we there yet?! The bottom that is? Many first time home buyers in Seattle have been postponing their home purchase because they’re not sure whether housing values have bottomed out yet. Even with mortgage rates at all time historic lows (see “Mortgage Rates Hit Record Lows” ), they fear they’ll kick themselves if they buy before values have reached bottom. Median home prices can help us gauge whether we’re still falling. With any statistical analysis there’s room for error, so median prices don’t guarantee ALL house values are decreasing/increasing. BUT it’s one of the best barometers we have. List prices could be rising because sellers and listing agents are continually seeing multiple offers. This soar in list prices could signal confidence that sellers can command higher prices due to increased demand and lack of decent inventory. Whether or not this strategy will translate into higher SOLD prices remains to be seen in the coming months. It’s not too late! If you’re a first time home buyer in King County there’s still time to get educated and make an informed decision. Go to our Calendar/Reservations page and sign up for one of our FREE First Time Home Buyer Workshops. Don’t make a decision before collecting ALL the facts!